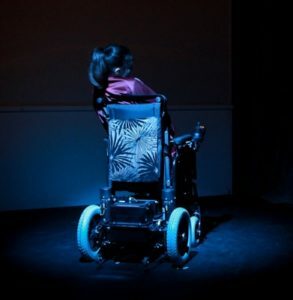 In The Wings is not a lecturing, educational piece about physical disability preaching the need for inclusion through frustrating or brutal contexts of exclusion. It is about ability – the ability of members of a family to communicate and pave their way into their future. And it shows that disability is not only physical. It is a well-crafted, well-directed, strongly acted, honest play about the dynamics of family relationships – albeit set in the context of one of the daughters being cerebral palsied. Of course, this family (comprising a single mother and two nearly adult daughters) has that pressure, but the emotions expressed by the characters are familiar, familial territory: sibling rivalry and how to articulate, negotiate and navigate the needs of the self in the context of generosity towards others through the crises choice brings. There are moments of beautifully realised tenderness, rawness and cruelty and moments where the characters grapple with their situation by speaking directly, and intimately to the audience.